After much research and soul searching we have decided not to dock our puppies' tails. A couple of adult dogs came with their tails docked. They were docked when they were only a few days old before I even chose them. I thought yorkies had to get their tails docked for their registration but now I know that yorkies can have full tails and still be registered, I wish my adult pups had theirs. I went over and over this subject in my mind and heart knowing I would have to make a decision with the puppies coming soon. When we had our first litter I made an appointment with our Vet to get the tails docked. I woke up the next morning and went to check on the puppies and change their bedding. There they were nursing and wagging their sweet little tails. Tears started to run down my cheeks. I knew I couldn't do this to their precious little tails. If there was a health reason to dock their tails, I would do it, but it is all about looks. The Yorkshire Terrier Club of America is in charge of the breed standards that the American Kennel Club go by. Part of their standard is having tails docked. ​Many countries have now made docking tails illegal. I wish that would happen here in the US, but that may take some time. Docked tails only matter if you plan to show in the conformation show ring of an AKC show. Since there are dogs that are purchased from other countries where it is illegal to dock tails, they are shown with full tails. They may get points off for the tail but since I do not show my dogs, I really can't say. Showing obedience and agility is not a problem if your dog has a tail. It is only AKC conformation shows that will frown on the full tail. Maybe if more people showed dogs with their tails intact the standards would eventually change. We can only hope. Continental Kennel Club (CKC) prefers you keep a yorkie tail intact. I was very happy to see this when I read about their breed standards. Most of the dog registries outside of the United States do not require that the tails be docked and many frown on the practice. We have now purchased 3 dogs from Europe and 1 from Canada who had European parents and they have their tails. ​We will not purchase puppies with docked tails! *An upright tail with a wagging tip indicates interest. *A relaxed wagging from side to side involving movement of the hind quarters indicates excitement. *A slower wag, more like a swishing can indicate intention for aggression. *Tail docking, or the cutting off of puppies' tails at an early age, is now illegal in many countries and allowed only by licensed veterinary practitioners in many others. Despite claims by those who practice it that dogs barely notice it, it has been shown to cause considerable pain and trauma to dogs, and tail sensitivity can remain throughout adult life. What is even more damaging is that the removing of the tail deprives dogs of the ability to communicate signals. *In a 2008 study scientists placed a robotic dog among a group of dogs in an exercise area. For some of the time the dog had a wagging tail, for the remainder, a stump for a tail. When the dog had a wagging tail, others approached playfully. When he just had the stump the dogs remained at a distance and more wary, showing their hesitation to read his signals. Not having a tail clearly puts a dog at a disadvantage when interacting with other dogs. *The good news is that as tail docking is done purely as a "fashion" exercise, and people become more aware of this and the consequences of the practice, the trend is dying out." It has been over four years since I last wrote about the cruel practice of tail docking for cosmetic reasons, and sadly, it remains a standard procedure in the U.S. for certain dog breeds. 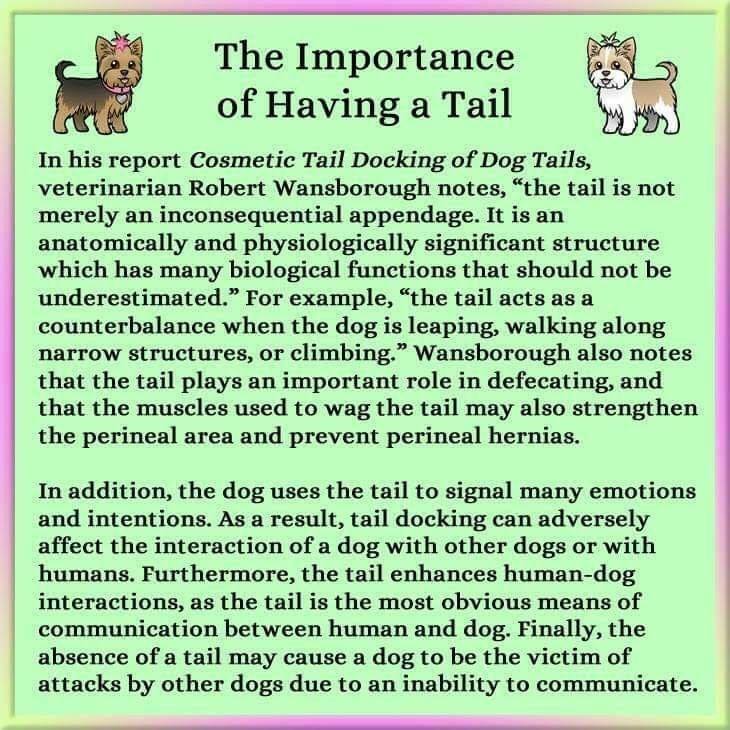 According to the American Veterinary Medical Association's (AVMA) January 2013 Literature Review on the Welfare Implications of Tail Docking-Dogs, routine tail docking is considered unacceptable by the majority of veterinarians and general public. The procedure is highly restricted or banned in many countries, including across Europe, Australia, Iceland, Israel, Norway, South Africa, Switzerland, and the Virgin Islands. In the U.K., tail docking is illegal except in the case of certain working dogs and breeds, but owners who receive an exemption from the law must be able to supply a certificate completed by the veterinarian who performed the procedure, and the dog must be microchipped. In addition, any dog docked after the 2007 ban cannot be shown at any event where the public pays an entrance fee. In the U.S., both the AVMA and the American Animal Hospital Association (AAHA) officially oppose tail docking for cosmetic purposes. However, the American Kennel Club (AKC) remains a staunch advocate, declaring that the practice is "integral to defining and preserving breed character and/or enhancing good health." Thankfully, other more progressive organizations, such as the United Kennel Club (UKC), are supportive of including animals in their events that have not been surgically altered. It's hard to comprehend why tail docking continues as an accepted, routine practice in the U.S. given what is known about the procedure. Tail docking is the intentional removal of a portion of a dog's tail. The tail is docked in one of two ways. One method involves putting a rubber band-type ligature around the base, which cuts off the blood supply and causes the tail to fall off in a matter of days. This is the method used by many breeders. The other method is amputation with either surgical scissors or a scalpel. Tail docking is generally done on 2 to 10-day-old puppies, without anesthesia. The cut goes through skin, cartilage, nerve endings and bone. Proponents believe very young puppies do not feel pain during docking. They believe canines are less developed than other animals at birth, with less sensitive nervous systems. "Evidence indicates that puppies have similar, if not increased, sensitivity to pain as adult dogs. Docking a puppy's tail involves cutting through muscles, tendons, up to seven pairs of highly sensitive nerves and severing bone and cartilage connections. Tail docking is usually carried out without any anaesthesia or analgesia (pain relief). Puppies give repeated intense shrieking vocalisations the moment the tail is cut off and during stitching of the wound, indicating that they experience substantial pain. Inflammation and damage to the tissues also cause ongoing pain while the wound heals. There is also the risk of infection or other complications associated with this unnecessary surgery." The rubber ligature method, in which the blood supply to the tail is cut off by strangulation, very likely also causes considerable pain to the puppy. Envision wrapping a rubber band tightly around your toe and leaving it there until you've lost all blood flow and sensation. It's not hard to imagine the extreme discomfort you would feel. 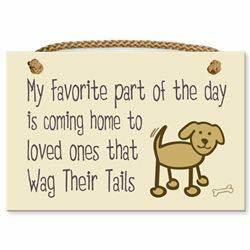 Until recently, many of us assumed that a wagging tail was nothing more than an indicator of a happy dog. But recent research suggests that when dogs feel stress, they tend to wag their tails to the left as a reflection of what's happening in the brain. Activation of the left-brain causes the tail to wag to the right; activation of the right-brain produces a wag to the left. The research shows that dogs wag to the right side when they encounter something pleasant. When they see something threatening, for example, a strange dog exhibiting dominant behaviors, they wag more to the left side. These results suggest that dogs notice another dog's tail wagging and use the information to decide whether the dog with the wagging tail is friend or foe. The researchers concluded that dogs aren't intentionally sending signals with their tails, but rather the tail wagging is a consequence of the inner workings of the canine brain. Tail-wagging behavior results from the way in which different emotional signals activate different parts of a dog's brain. So now we understand that removing a dog's tail is not only painful, but can also significantly impair his ability to communicate with other dogs, as well as humans. One of the primary excuses given for "preventative" tail docking is to avoid tail injuries. However, according to the AVMA's Literature Review, tail injuries are rare, ranging from .0021 to .0039 percent in dog populations per year. Interestingly, one study found that Lurchers, Whippets and Greyhounds had the greatest risk of tail injury – three breeds whose tails are not traditionally docked. The same study reported that working dogs (primarily gundogs) were not at significantly greater risk of tail injury than non-working dogs. According to the AVMA, there is no evidence to suggest that dog breeds whose tails are traditionally docked have a significant risk of tail trauma that would justify cutting off their tails. Further, based on the most current data available, around 500 dogs need to be docked to prevent one tail injury. Tail docking supporters make the point that most breed standards do not allow for undocked animals. The AKC, while it has no rules specifically requiring docking, is not likely to score an undocked show dog highly for conformation. Breed standards for docked animals establish severe penalties for undocked dogs. Dog owners who want to show their animals can feel pressured into docking in order to compete in the ring. In my opinion, the ideal standards for the appearance and function of our canine companions are quite evident at birth. Their tails were created exactly the way they were meant to be – not as excess appendages that need to be lopped off. "Performing a surgical procedure for cosmetic purposes (i.e., for the sake of appearance) implies the procedure is not medically indicated. Because dogs have not been shown to derive self-esteem or pride in appearance from having their tails docked (common reasons for performing cosmetic procedures on people), there is no obvious benefit to our patients in performing this procedure. The only benefit that appears to be derived from cosmetic tail docking of dogs is the owner's impression of a pleasing appearance. In the opinion of the AVMA, this is insufficient justification for performing a surgical procedure." There has been common belief for many years, that docking a three-day old puppy's tail was a painless procedure due to the puppy's immature nervous system. This justification derived from the belief that as altricial species, day-old puppies would not feel pain due to lack of mielinization. Animals considered to be altricial are those which at birth are immature, and therefore, totally dependent on their mothers. Cats, dogs and human beings are all considered to be altricial species. At the opposite side of the spectrum, are precocial species which are quite independent at birth. These animals see, hear and can often even stand up, just minutes after being born. Calves, foals, baby ducks and turkeys are good examples of precocial species. The immaturity at birth typical of altricial species has been linked to an immature and underdeveloped nervous system, causing people to believe that a newborn puppy is, consequently, not capable of feeling pain. Recent studies and advanced knowledge on pain, however reveal that this is far from being true. Australian veterinarian Robert K. Wansbrough explains, in an article published in the Australian Veterinary Journal, that anatomical studies demonstrate that pain in day old puppies would be actually more than in an adult dog due to the way impulses are sent through the puppy's unmyelinated fibers. Their slower conduction due to incomplete myelination, is offset by the shorter interneuronal and neuromusvcular distances the impulse has to travel, therefore, creating greater pain due to the pup's undeveloped inhibitory pain pathways. Dr. Robert further explains that cutting through muscles, tendons, nerves, bones or cartilages, would result in intense pain to a level that would never be allowed to be inflicted on a human being! Understanding Pain Reactions in Day-Old PuppiesThe fact that pain is present in neonatal altricial species explains why so much care and dedication is involved in neonatal pain management in the human world, explains veterinarian Jean Hofve with the Animal Protection Institute. One report from the Department of Pediatrics at the Washington University School of Medicine suggests that even prematurely born babies which are also altricial species exhibit responses to pain. A puppy's whimpering and ''escape response'' should, therefore, be sufficient to indicate an intense level of pain. However, veterinarian Robert Wansbrough further points out that lack of showing signs of suffering in some puppies should not be automatically translated as lack of pain. Indeed, dogs as animals are prone to appear stoic due to an ''inherent preservation instinct'', where showing pain is a sign of weakness which may potentially attract predators. Another common myth is the assumption that just because puppies go back to nursing right after being docked, translates into a puppy with no pain. However, studies on this reveal the opposite. Veterinarian Jean Hofve points out that research demonstrates that the act of suckling releases endorphins, which are natural pain relievers, and therefore, a much more realistic and plausible explanation is provided for the docked puppy's sudden desire to nurse. The reasons I hear from breeders of Yorkies, for docking tails makes absolutely no sense to me. One of the reasons I hear most is "No one will buy one of my puppies if the tail is natural" and another is "I think the tail is ugly" and still another is "AKC standard is a docked tail." I have never heard a good reason that would make me mutilate and cause pain to my puppies. Why would anyone who loves animals want to cut body parts off of them for any reason? We have decided to register all of our puppies with Continental Kennel Club because they prefer a natural tail on a Yorkshire Terrier. We will always allow our puppies to wave their sweet, expressive tails proudly and happily! Here are some links to websites that give more information on tail docking. Just copy and paste the address in your browser and you will get to the website!